It has been a long time since I posted a June 2014 trip report. Life happens and our plans often go awry. I have shared various articles relevant to me, and hopefully to you, my reader, between original posts . Here is the next original chapter from my June 2014 trip. Thank you for your patience and your continued support. We arrive at the Magic Kingdom around 9:30. We walk down Main Street, enjoying the sights, sounds, and scents that are so unique to this part of the park. We take the Fantasyland spoke off the hub, and head toward the Seven Dwarfs Mine Train. We have a FastPass for the first hour after park opening. Magic Kingdom is already getting crowded, even at this early hour. It is extremely hot and humid, which is expected in June. I had not realized before today that the path inclines from the hub into Fantasyland. Most of the Magic Kingdom is built on the second floor, above the utilidors, which are at ground level. Is Fantasyland constructed on a third level of the park, or is this section of the park higher to afford flexibility in design of the attractions? 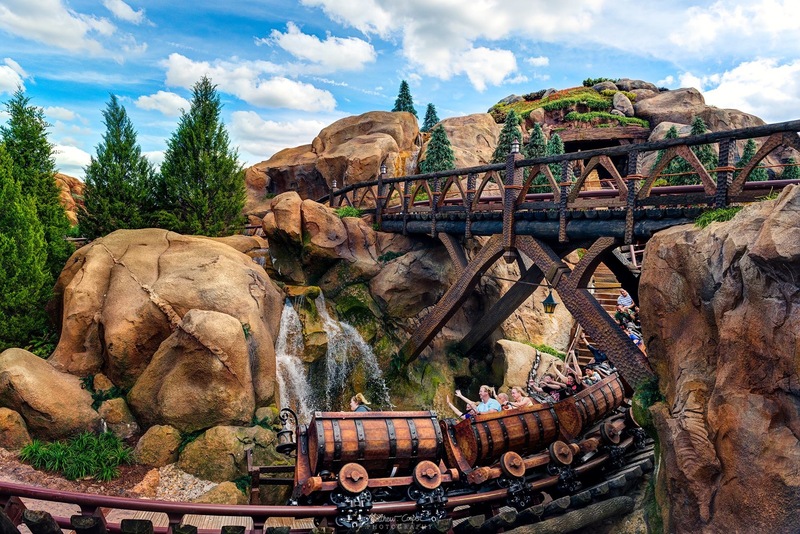 After reading so much about the newest addition to Fantasyland, Seven Dwarfs Mine Train, I am excited to finally be experiencing this attraction. The FastPass line moves very quickly and soon we are stepping into a mine car. The ride is smooth, for a roller coaster. There is none of the usual coaster click-clack. This is one of the milder coaster experiences in the various parks. Details included by the Imagineers make this a very scenic ride. The hills and waterfalls seem so realistic. The dark portion of the ride, into the mine, brings to life all of the dwarfs using a new 3-dimensional technology. Those familiar faces seem to have stepped right out of the cartoon. Imagineers also included various components from Snow White’s Scary Adventure to pay homage to that original attraction. We do not sense the swaying of the mine car as much as we had thought we would. After visiting with the Dwarfs, we walk over to the Under the Sea ~ Journey of the Little Mermaid attraction. We fondly remember taking our daughter to view this movie when it first came out. It has always been one of her favorites. Through various effects, the journey takes you under the sea in a clamshell as you relive Ariel’s story. It is cute, but definitely themed for families with younger children. I would have preferred an attraction extending the story, not just a ride through the actual story. We are hungry by the time we finish our journey with Ariel. We take a leisurely walk through Fantasyland, making a short rest stop at Rapunzel’s tower. Then we cross into the ‘new world’ of Liberty Square. I really enjoy the theming of this area of the Magic Kingdom. The Imagineers captured every detail from Revolutionary America, right down to the sagging shutters held up by leather, because metal was scarce during the time period of the Revolutionary War. Imagineers even included a pitch toward the center of the walkway, which is painted brown to represent the sewage found in the streets of that time period. We eat our lunch at the Columbia Harbour House, sitting at a window on the second floor. The service and food are excellent for a Quick Service location, and the atmosphere hark ens back to the taverns of the period. We had a great view of my favorite attraction, the Haunted Mansion. After lunch, we meander through Liberty Square, over into Frontierland, and on to Adventureland. We have a FastPass reservation at Pirates of the Caribbean. I would say that this is probably my second favorite ride in all of Walt Disney World. It is a classic, and I fondly remember experiencing it as a child in both Disneyland and Disney World. The ride has changed some, with nods to the various live-action movies. We get wet, a little, during one of the larger drops of the boat. At the time of this post, Pirates of the Caribbean is due to go down for refurbishment for some time. I will not be able to ride it during my next trip in June of 2015. However, I am looking forward to additional scenes and improved technologies this refurbishment might bring. Our morning at Magic Kingdom has been full of new experiences found memories. As we make our way toward the train station to exit the park, we once again take in the sights and sounds of Main Street. This includes a walk through the Emporium for a little souvenir shopping. I would have enjoyed spending more time in the Magic Kingdom today, but circumstances would not have allowed. However, I intend to spend more time, and more days, enjoying Walt Disney’s original realm during my next visit. Next > Enjoy your weekend!